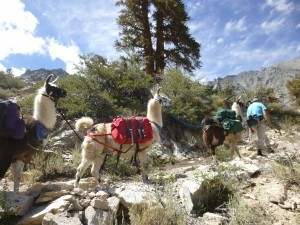 This is our 21st summer packing with our Llamas into the High Sierras. Over the years we’ve had ten llamas: Machu, Pichu, Hopi, Mica and Sierra all now walk the next world; Miwok and Jambo, the parents of Llao Llao and Zuni, and Tio Sequoia are with us now. Over the years we have packed into the Lost Coast of Northern California, all over the central Sierras including the Dinkey Wilderness, Black Cap Basin, Red Mountain Basin, Bench Valley, the Silver Divide, out of Florence and Edison Lakes and Courtright Reservoir, and into East Lake out of Bridgeport, commemorating the place Jim and I met 32 years ago, backpacking before we had our llamas. 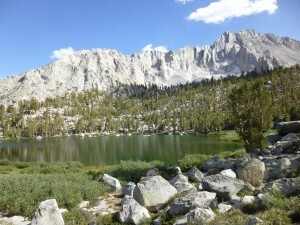 This summer we decided to cross the Sierras and head in near Mt Whitney from the jagged and dramatic Eastern slope, planning to hike over 12,000 ft Kearsarge Pass into the Rae Lakes Basin. It sounded fabulous until some of our llama buddies warned us that there is no grazing and no dogs allowed across the pass in Sequoia National Park, only in the Sequoia National Forest on this side of the pass. We can get along with no grazing as we can carry sufficient food for our llamas, but no dogs? No Tashi and Beau? That’s a non starter. So we decided to stay with the plan to drive from our ranch near Yosemite, south across the Sierras past Lake Isabella, to Lone Pine, boarding the llamas overnight at the Lone Pine High School as guests of the Future Farmers of America. We would drive north next morning to the 9000 ft Onion Valley Trailhead out of Independence, and trek up toward Kearsarge Pass, but not across into the National Park. That plan assured maximal happiness for us all: our five llamas, Jim and me, and our two athletic backpack-carrying poodles, Tashi and Beau, a perfect recipe for the Zen of Packing with Llamas into the John Muir Wilderness! So it was that we set out three days ago, and so it was that I am breathing and smiling deeply and broadly here in the gorgeous High Sierras. What is truly Zen about this experience is that packing up the llamas, each with their colorful packs is a meditative ritual, and setting out on the steep ascent is a devotional exercise. Jim takes the lead with the two girls, Miwok and Zuni and Sequoia, followed by Tashi, with his own little “Search and Rescue” lime green pack. I follow with the two boys, son Llao Llao and his father Jambo. Puppy Beau elects to bring up the rear carrying his own small blue pack of dog food and toys. Climbing ever higher, one step at a time, slowly, slowly into ever thinner air, we ascend 1600 feet, switchback by switchback over a beautifully maintained trail. With each breath, I feel Llao llao’s gentle breath cooling the back of my neck. As we fall into a rhythm, I turn on my iPod and listen to Buddhist chanting, the meditative strains of Avolokiteshvara, and fall into a perfect Zen reverie. We are back in the high country we both so love, this haven of natural beauty and restorative calm. Peace Is Every Step. I have arrived. I am home. 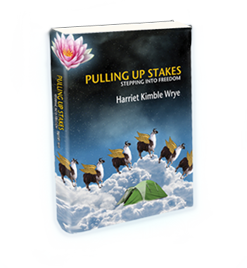 I just finished reading “Pulling Up Stakes”. You words/stories inspired me and moved me and I wanted them to go on forever. Imagine my delight to find your blog! I will start at the beginning and read every posting. I send my deep gratitude for your sharing of your path in such clear and captivating writing. My mindfulness teacher, Tara Brach, (“Radical Acceptance” and next Feb. “True Refuge) is in Washington, DC. My husband and I live in the mountains of Western North Carolina near Asheville and will be visiting the nearby Cloud Cottage and Mountain Mindfulness Sanghas soon.